Directed by Bob Persichetti, Peter Ramsey and Rodney Rothman. I’m usually a little suspicious of films with multiple directors that aren’t siblings. Though it can be argued the Spierig brothers and the Wachowski’s have made some suspect pictures – think Winchester (2018) or Jupiter Ascending (2015) – usually multiple directors in something other than anthology films speak of behind the scenes production issues and on set problems. On the other hand, there’s a movie like Spider-Man: Into the Spider-Verse. I finally got round to it yesterday, at the end of its run in Hobart, and I’m so glad I saw it initially on a big screen. This movie is very special at a number of levels, not least of which is its massive vision, courtesy of producers, Phil Lord and Chris Miller. The script by Phil Lord and Rodney Rothman is excellent, making sense of what could’ve been very messy in lesser hands. But the big thumbs up from me goes to production designer Justin Thompson, who gave this ambitious project its amazing look. At times it’s like being in an animated comic book and it took me a few minutes to get used to it. Also, this is very action-heavy but most scenes have a central point to frame around, making it easy to follow. The animation is top class with multiple Spider-people and villains innovatively appearing in appropriate styles, and the level of detail here wasn’t lost on me. This mostly echoes the work of Steve Ditko and Stan Lee, and it is a fabulous homage to them both. Narratively, the set-up was excellent. 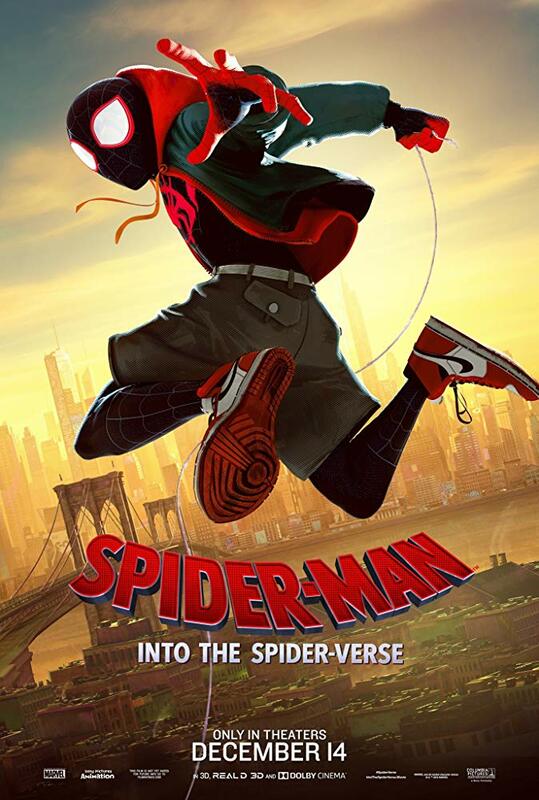 Miles Morales is a teenager struggling to fit in to his new school, maintain a good relationship with his loving parents but still hang out with his shady Uncle Aaron. Once he gets bitten by the radioactive spider, the action goes into overdrive and it’s a pure delight. As a PG rated film in Australia, this is suitable fare for family viewing and I was impressed at how many kids were at the session. Essentially, the story is about belonging, family, friendship and expectations – mostly those we impose on ourselves – and it hit all the right beats with me. It also has to be noted there are moments that are genuinely laugh-out-loud funny. The voice cast are uniformly outstanding and the soundtrack is excellent. Do wait for the post-credit scene – it’s worth it! All in all, it’s a movie that’s about superheroes of all ages, ethnicities, genders and even species. While there’s plenty for adults, it’s perfectly suitable for younger viewers and it’s a total joy to watch. Destined to become a classic for its technical innovations and feel-good story.